Thoroughbred horse racing comes to Maryland on the third Saturday in May each year for the second and shortest leg in The triple Crown the Preakness Stakes. This week-long celebration concludes at Pimlico Race Course in Baltimore and determines if there will be a Triple Crown contender for the year. 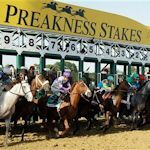 The winner of the Kentucky Derby will square off against some familiar faces as well as some new ones as the best three year old horses go at it in The Preakness Stakes. The Preakness has been running since 1873. Many traditions have taken root during the race’s long history. The Woodlawn Vase is presented each year to the owner of the Preakness winner. The vase was made in 1860 by Tiffany and Company. Prior to 1953 the actual vase was awarded and kept by the owner until the next Preakness. Today a sterling silver replica goes to the winning owner while the original remains on display at The Baltimore Museum of Art. The official drink of The Preakness is the Black-Eyed Susan. Here is the recipe: 1.5 oz Vodka, .5 oz St. Germain, 2 oz Pineapple Juice, 1/4 oz Lime Juice, and 3/4 oz Orange Juice. Garnish with an orange slice and a cherry. Cheers! Here are the most recent winners of The Preakness Stakes. See the full list of Preakness Winners.